Much like his image on the huge billboard on the side of Aviva Centre in Toronto, Milos Raonic’s tennis continues to come into sharper focus. On Wednesday night, he made his debut at the 2016 Rogers Cup with a dominant 6-3, 6-3 win over No. 70-ranked Yen-Hsun Lu of Taipei. Despite not having played a hard-court match since March and showing no signs of any hangover after losing the Wimbledon final to Andy Murray 17 days earlier, Raonic was in total control, except for having to save one break point in the second set of the 66-minute Centre Court match. The Raonic numbers were solid – 80 per cent of first serve points won and 71 per cent on second serve as well as three of seven of break point chances converted. He frequently smiled on court, drawing in the large, partisan crowd and finished with a flourish belting a 132 mph second serve on match point that handcuffed the over-matched Lu. Ever since John McEnroe was hired as a consulting coach before Wimbledon – to go along with Riccardo Piatti and Moya – the Raonic coaching situation has been a constant topic in his media conferences. On Wednesday night, he spoke more about the situation saying, “Carlos has been there with me now almost seven complete months – six-and-a-half months. He’s had a very positive effect on me. “John has also had a positive effect over a shorter period of time. I think it’s the way you look at where I was. I feel like maybe it would have been the time for me to have done this a little bit earlier – last year when I got up to No. 4 in the world. But obviously I didn’t have that possibility considering all the injuries. On Thursday evening at 6:30 p.m., Raonic will face qualifier Jared Donaldson of the U.S. a 6-3, 3-6, 6-3 winner over Fabio Fognini on Wednesday. Fognini won the ATP 250 title in Umag, Coatia, on clay on Sunday and was probably fated not to go too far at Rogers Cup because of the difficult continental and surface transition. The No. 145-ranked Donaldson, who has been somewhat forgotten among the young American prospects such as Taylor Fritz, Frances Tiafoe, Tommy Paul, Rielly Opelka, Stefan Koslov etc., has not been that impressive in 2016. But he did qualify and reach the second round in Washington last week before losing 6-0, 7-5 to Frenchman Benoit Paire. As a point of reference, in March at the BNP Paribas Open in Indian Wells, then No. 43-ranked Vasek Pospisil beat the 19-year-old Donaldson 7-6(5), 6-7(2), 6-3. It’s probably not too often that a young player will so vividly remember a specific shot from his very first Masters 1000 event and his opportunity to reach the third round at his hometown tournament. But Denis Shapovalov will likely not soon forget the forehand sitter he missed wide on Wednesday night when he led Grigor Dimitrov 3-1 in the first set, and seemed to be cruising at 30-love in his service game. But a careless swing and the ball flew wide and a 40-love lead evolved into a close game which eventually went to Dimitrov and allowed him to get back on serve. Another break to 5-3 and the 25-year-old Bulgarian had all he needed to wrap up the first set. A service break to 3-1 in the second set – in a game that Shapovalov led 40-15 – basically sewed up the victory for the heretofore struggling Dimitrov, currently ranked a sobering No. 40 after being as high as No. 8 in 2014. Shapovalov played with a lot of verve and flair – his whippy forehand is a major weapon and his backhand can be even more spectacular when he strikes it just right. His natural showmanship came to the fore in the eighth game of the second set when he scrambled to his backhand corner and improvised a tweener shot down-the-line that kept him in the point. When he wound up winning it with a forehand cross-court passing shot winner he celebrated with a big smile as the crowd erupted with a loud roar. All and all it has been a terrific event for Shapovalov, beating the No. 19 player in the world, Nick Kyrgios, on Monday night, and showing that he can perform so well and so precociously on one of the biggest stages in the game. “He’s the more experienced player and obviously he should be Top 10, he’s got the game,” Shapovalov said about Dimitrov. Referring to that fateful forehand miss in the sixth game of the opening set, he said, “I had a chance. I forget what the score was but I had a pretty easy ball and then I missed it. Then right after that I got broken. So I’ve got to clean up those shots, not miss a couple of easy shots. Looking ahead to National Bank Challenger tournaments he will play in Granby, Que., and Gatineau, Que., the next two weeks, he said, “for sure it’s been great, but I’m not gonna think about this result too much. Every week is not going to be like this. It’s going to be ups and downs, obviously. “Next week is a new week. I’m going to go out and play every match the same way I do here and see how it goes. I’m not going to think of anything if I lose first round or anything. Vasek Pospisil had an extremely frustrating day at the office in his second-round outing on Wednesday against Gael Monfils, losing 7-6(6), 6-0. The No. 101-ranked Pospisil played a solid first set but it all fell apart in all too familiar fashion in the tiebreak. For someone who had lost nine of his last 10 matches entering the tournament, what happened in the tiebreak was devastating. Ahead 5-3, Pospisil served and had a forehand into the open court but missed it wide. Then holding a set point at 6-5, he totally miss-hit a forehand that flew high out of court. It’s not hard to imagine what demons are in the head of a player who is struggling and he misses a shot so badly on such a big point. Two points later – a forehand passing shot winner by Monfils and a service return out of court by Pospisil – and the 29-year-old Frenchman had the tiebreak and the set. There followed a more than 10-minute rain delay, aggravated by a decision made and then reversed to send the players off the court. Monfils, seemingly relaxed, talked to umpire Carlos Bernardes during the stoppage. “This happened to me last week against Zverev in Washington and I had to come back and serve right away,” he joked to the Brazilian. Monfils then saw the ATP physio arriving to treat him but, in the process of stretching his leg at the time, informed him that the issue was resolved and he didn’t need any help. While Monfils went with the flow during the rain delay, Pospisil apparently festered and played a poor second set, which might have not been quite so bad had he converted three game points when he served trailing 3-0 in the second set. Pospisil will try to regroup for an opening-round doubles match on late Thursday afternoon as he and Daniel Nestor, seeded sixth, will face Pospisil’s former partner Jack Sock and Nick Kyrgios, who was seen on site practicing with some vigour on Wednesday. Earlier on Wednesday, Peter Polansky was beaten 7-6(5), 6-4 by qualifier Radek Stepanek. The 37-year-old Czech has experienced quite a revival this year and had just enough gas in the tank to get over the finish line ahead of Polansky on a humid, hot day when the temperature reached as high as 34 degrees. In the first set tiebreak, Stepanek led 4-1 with the help of some poor play by Polansky who then caught up to 4-all with a rash of unforced errors by Stepanek. The Czech went ahead 6-4 with a neat angled drop shot winner and a service winner before Polansky climbed back to 6-5 down with a good forcing forehand on the first set point against him. On the second, Stepanek returned serve within centimetres of the baseline and Polansky’s reflexed reply was short and quickly dispatched on the forehand by Stepanek. First set – Stepanek. The second was close but Polansky lost his serve in the final game when he made a couple of costly forehand errors. Stepanek, who claimed he almost didn’t play because of a neck issue (although he later went out and won a doubles match with compatriot Tomas Berdych), looked exhausted near the end of the match. “I felt like I had an opportunity there, so I’m disappointed,” Polansky said. Polansky, ranked No. 247, will play the $100,000 National Bank Challenger event in Granby, Que., next week while Stepanek faces a slightly bigger challenger – world No. 1 Novak Djokovic in a third-round night match on Thursday. Steven Diez, who reached the second round with a victory over emerging Briton Kyle Edmund on Monday, also saw his tournament end on Wednesday when he lost 6-3, 7-6(5) to No. 12 seed Bernard Tomic. The 25-year-old from Spain, via a childhood in Toronto, had his chances in the second set but Tomic came up with the timely shots – often big serves. Tomic hit two big serves in the last few points and that made matters easier for the 23-year-old Aussie. Genie Bouchard is delighting the crowds at STADE IGA as she continues her fine play at Coupe Rogers in Montreal. After beating No. 28-ranked Lucie Safarova in a thriller on Tuesday evening, she came back on Wednesday and outclassed No. 10-ranked Dominika Cibulkova 6-2, 6-0. The complete opposite of their third-round match at Wimbledon which the 27-year-old Slovak won 6-4, 6-3, this time it was Bouchard who bossed the rallies and Cibulkova who was more prone to making the unforced error. The match lasted only an hour and 13 minutes so the 22-year-old Montrealer, bothered by a gastro issue on Tuesday, should be fine heading into her third-round against Kristina Kucova on Thursday night. The 26-year-old Slovak is a qualifier ranked No. 121. If she beats Kucova, Bouchard would play the winner of lucky loser Vavara Lepchenko of the U.S., ranked No. 50, and No. 14 Johanna Konta of Britain, whom she beat in the second round of Wimbledon last month, to secure a semifinal spot. In that potential semifinal she might play either fourth seed Agnieszka Radwanska or No. 6 Venus Williams. While all the talk has been about Milos being the first Canadian man to win the Rogers Cup/Canadian Championships since Bob Bedard in 1958, maybe now is the time to think about the chances of Bouchard being the first woman since Faye Urban of Toronto in 1969 to be champion at the nation’s major tournament. 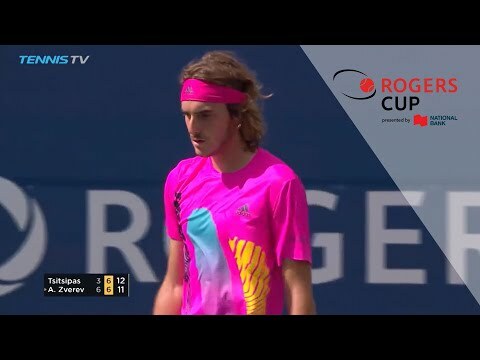 You have to wonder about Rogers Cup security, which has been generally pretty strict, when a guy wearing this hat is allowed into Aviva Centre! Want to stay up to date on all our offers and promotions? Sign-up for our newsletter to receive updates from the tennis world, special offers and stay up to date on the latest Rogers Cup presented by National Bank news from Montreal.